AMD this week started selling its entry-level Athlon 200GE APUs designed for the most affordable PCs. The Athlon 200GE costs less than $60 at retail and happens to be the cheapest processor carrying AMD’s Zen cores as well as the Radeon Vega iGPU. It also has a 35 W TDP and is therefore compatible with virtually all AM4 motherboards and cooling systems. 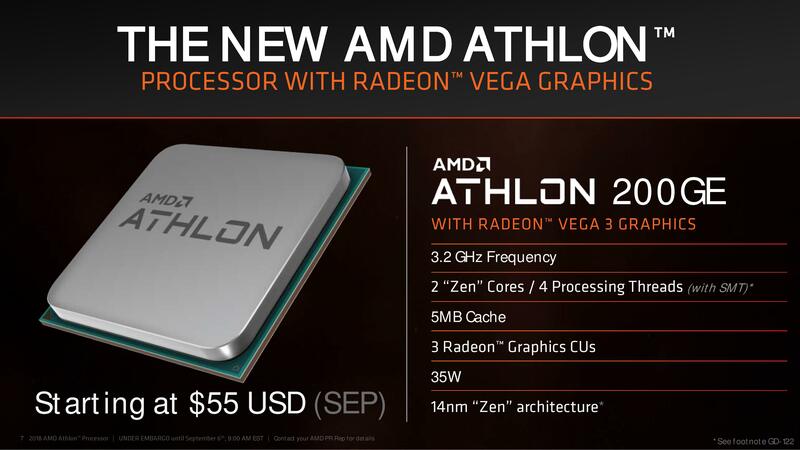 The AMD Athlon 200GE carries two SMT-enabled Zen cores running at 3.2 GHz frequency, a Radeon iGPU featuring 192 stream processors operating at 1 GHz, 1 MB L2 cache, 4 MB L3 cache, a dual-channel DDR4-2667 memory controller, and so on. The APU can power affordable PCs that do not need a lot of compute horsepower and enables AMD to compete against Intel’s entry-level Celeron and Pentium processors for this market segment using its latest technologies (Zen and Vega). Notably, even with the low price, AMD isn't holding back on feature support here. Since the CPU is drop-in compatible with AMD’s 300 and 400-series platforms, systems based on the CPU will support high-performance NVMe SSDs, USB 3.1 Gen 2 interface, 4Kp60 display output(s) and so on. As an added bonus, AMD’s AM4 platforms also support DRAM overclocking and an upgrade path all the way to eight-core Ryzen 7 CPUs. In addition to the Athlon 200GE processor, AMD is gearing up to release its higher-performing Athlon 220GE and Athlon 240GE processors later this year, which will further improve its competitive positions in the entry-level segment. While AMD has formally started to sell its Athlon 200GE processor, its actual availability is a bit of a mixed bag. In the U.S., the Athlon 200GE can be pre-ordered for $59.99 only from Newegg. Other stores may follow shortly, but right now the chip is a rare animal in the U.S. The processor is more readily available in the U.K., but prices vary greatly from £50 to £73 ($65 - $96). 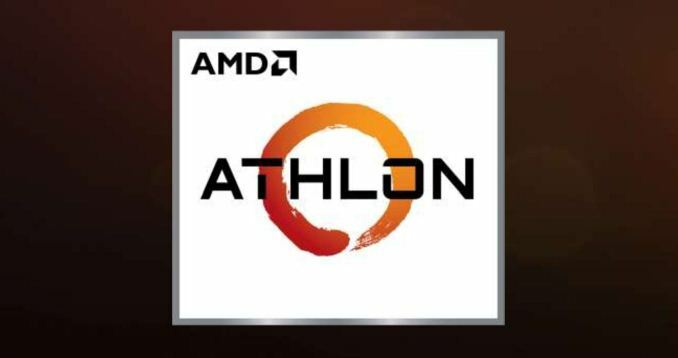 The situation is much better in mainland Austria and Germany: the Athlon 200GE can be purchased from multiple retailers at prices that make sense. Meanwhile, Amazon seems to overprice the chip in France and Spain. if they are not careful with price, they will encroach far to close to the 2200g ($100) really does not leave them much room to not screw their own line up. price, clock speeds, vega cores etc, there is not all that much wiggle room TBH IMHO.....now if they can get Navi out the door asap that would be great, RX 500 series has been way too long above MSRP/SEP levels, in many cases $40-$800 or so above what they should be, I think the only ones that were and maintained pricing for the most part was the true low budget cards (example RX 550) the rest (especially Vega) are massive price gouged. $60 isn't encroaching. Also price is just one factor, it's in an entirely different TDP bracket. It's like comparing a Surface Pro to a gaming laptop and then cautioning they're "encroaching" on gaming laptops due to pricing. Seriously this is something I can see being crammed into slim desktops for offices and casual users. It's competing with low-to-mid TDP entry-level Pentiums and Celerons (some of which are Atoms by another name). I agree. The Duron never really "encroached" onto the Athlon. It didn't survive because the performance delta compared to the Athlon (not accounting for overclocking on the Duron) didn't justify the savings. This is likely to be the case here. For $100, the 2200G is going to have twice as many physical cores, higher clock speeds - WITH turbo, more cache, and more Vega cores. It's twice the processor at less than twice the price. AMD is shooting for the ultra low end here, where OEMs can use the cheapest possible chipsets, the lowest output PSU's, in the smallest possible cases. I suspect many won't even have ATX\ITX\SFX power supplies and actually use a 100w power brick, because you can bet the motherboards wont even have a PCIe connector. We've seen these systems so many times. Think E1-1200's, the slowest, most aggravating AMD chip in recent memory. These 200G's wont be THAT slow but we are talking pretty poor performance here with just TWO 3.2GHz Zen cores sharing what appears to be a pretty substantial victim cache. That is a WHOLE lot of performance speculation there considering you have absolutely zero data to back it up. When I said this was targeting the "Atom segment" I meant the ultra low price market segment. Keeping in mind the Pentium and Celeron are still quite expensive, and AMD has historically (for the last 30 years) never been able to compete directly with Intel in the equivalent price segment (again, DON'T confuse this statement with performance, I'm talking about category here!) this will compete with the Atom and perhaps Celeron in the marketplace, much like the Ryzen 3 competes with the Pentium, Ryzen 5 competes with the Core i3, and Ryzen 7 competes with the Core i5. A) most people shopping for an i7 are buying looking for the most premium product, and OEM's know the AMD brand is a tough sell at retail so the Ryzen 7 is generally equipped in a PC similar in spec to an i3 or i5, ie, no NVMe SSD, if an SSD at all. You're forgetting the fact that both Athlon and Duron were targeting the same desktop PC form factor. The 2200G and 200GE probably target very different segments. Anyone looking for something like a silent NUC-type device doesn't need a 2200G. And it will still offer enough performance for any menial tasks that take up a lot of most people's time. Youtube? Facebook? Video and music? Check. Of course, 5 months later, more Duron (and Athlon) CPU's were released targeting mobile and some Athlons actually ran at lower power (15w) compared to all Mobile Durons being 25w. The Athlon XP eventually replaced the Duron all together, including the mobile segment models. "Think E1-1200's, the slowest, most aggravating AMD chip in recent memory." It would make sense to have $ amounts to exclude tax to make international comparison easier. Say the proshop's 54eur = 45 eur without tax = 53$. This obviously doesn't help you much when actually buying, but you generally aren't buying stuff for $ in EU anyway.